Costa del Sol extends along more than 150 km of coastline in the province of Malaga in southern Spain. It’s known as “Coast of the Sun” due to its 325 days of sunshine all year around, allowing you to enjoy the outdoors whenever you like. You have a wealth of sun-kissed beaches to choose from to get your golden tan. Among them are Playa Nagüeles, facing the Marbella Senses complex. With its vast extension of fine sands and crystal-clear waters, it also boasts some of the most exclusive beach clubs in the area. Head to La Cala de Mijas Beach for a more secluded slice of paradise with gorgeous coves and palm trees. Playa del Saladillo and Playa del Sol Villacana are also renowned as the beaches of bliss in Estepona. If you want to experience authentic Spanish culture, there are certain towns you must visit during your travels. Malaga, the region’s capital, is a truly ancient city boasting stunning architecture, reflected in its churches, Malaga castle and Picasso’s home, now a glorious art museum. Marbella is another top favourite for holidaymakers due to its impressive offer of golf courses, Mediterranean-cuisine restaurants, nightlife and beach bars. Estepona owes its attractive reputation to its “old town” charm, offering you the best authentic Spanish lifestyle along Costa del Sol. Along its narrow, cobblestone streets you will find many tapas bars serving traditional Spanish delicacies. 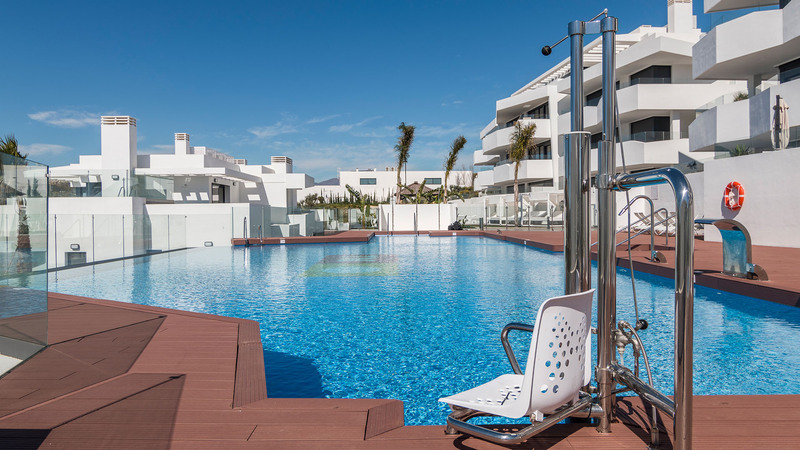 La Cala de Mijas also enjoys a village feel combined with a host of excellent leisure facilities, including Mijas Water Park, packed with water slides, wave pools and a lot more to keep the kids entertained. “Golf Valley”, near the Dream Gardens resort, is a paradise for those who love this sport, offering nine excellent golf courses. With an average of 20 minutes from Malaga International airport, you will have the perfect excuse to visit all these alluring locations on the Costa del Sol.